Check out our new AFYA Hair Free Club Membership! Interested in Dermaplaning? Find out how you can pay less and get the most with our new membership program. Dermaplaning is an innovative facial technique that uses a specially designed exfoliation blade to remove the outer layers of dead skin for a smoother, brighter look. * Come into our Guelph Office today for your complimentary consultation! Dermaplaning is a simple and safe procedure that exfoliates the epidermis and removes fine vellus hair. It has been used for centuries to help achieve smoother, younger-looking skin. * The procedure uses a small scalpel blade that lightly glides through the dead skin barrier to loosen and remove the outer layers without pain or downtime. As the scalpel glides across the skin, it also removes the peach fuzz, which gives the skin and brighter and smoother complexion and feel. * This treatment allows your at-home skin care products to penetrate more effectively and your makeup to glide on smoother. At AFYA Skin and Body Clinic, in Guelph, we treat a variety of skin types and ages with the Dermaplaning treatment. 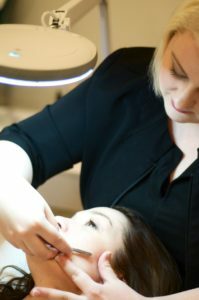 The Dermaplaning will take approximately 30 minutes, followed by extractions, active serum application and a calming mask for a total of a 60-minute treatment. The skin will feel and look smoother immediately. Some pinkness and tingling can be seen for 24 to 72 hours after the treatment. Dermaplaning can be done as a stand-alone treatment or in conjunction with other services such as Chemical Peels and Microdermabrasion. We recommend Dermaplaning as a monthly maintenance treatment to control dead skin build up and remove the unwanted hairs. The treatments can be done every 4 weeks on a continuing basis. Results will be seen immediately after the treatment and will continue to improve over time.